Nitrile Gloves by Medline®, Medical exam quality, Meets or exceeds ASTM D6319, latex free and allergy free. 200 Gloves Per Box / 100 pairs of gloves total. This item is a slightly larger box than standard and is packaged with 100 paid of gloves. 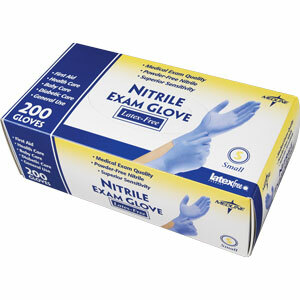 These nitrile exam gloves are powder free and they have a great feel which is superior sensitivity to other nitrile gloves. Use our Medline® Nitrile Gloves for first aid, health care, baby care, diabetic care and industrial purposes. 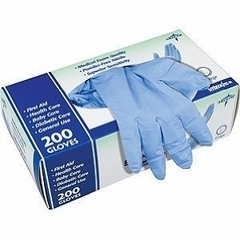 These nitrile Gloves are available in Size Small, Medium, Large, Ex-Large.